So much for thinking that I would be so tired that I might sleep in this morning. Like clockwork, I was wide awake at 4:15am (Mexican time) which has made for quite a long day! After doing to Internet research and drinking three or four (or more) cups of coffee, I was joined by Kevin and Anna for our first Red Tree House Breakfast. We enjoyed chilaquiles with beans and eggs. Of course, we also enjoyed papaya, pineapple, bananas, watermelon, conchas, churros and freshly squeezed juice. 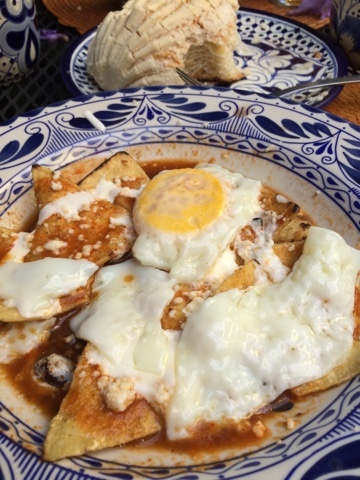 We needed to eat up for our busy day of exploring the Coyoacan neighborhood. 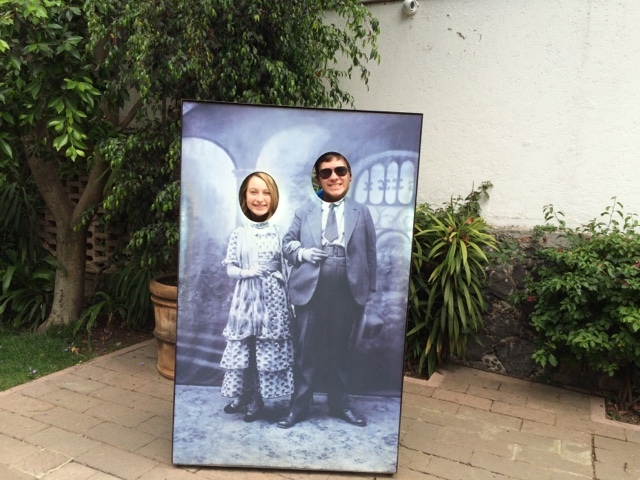 This is a silly shot taken outside of the Casa Azul (Frida Kahlo’s home and museum in Coyoacan). We were brilliant and purchased our tickets online. This made our wait only about 30 minutes. The place was packed and most other visitors were told their wait to get in would be about 3 hours today. It’s a really neat place that I wanted to show the kids. Even though they aren’t familiar with Frida and Diego like I am, they still found her life story and her artwork to be very interesting. We spent a few hours after the museum walking around Coyoacan. We visited the local market and the kids were amazed at the piles and piles of fresh fruits and vegetables. They saw many things for the first time! We then visited the Mercado de Artesanias in the main square of Coyoacan. This market had a variety of crafts as well as variety of strange stuff. There were tattoo stands, a dreadlock stand (too bad Kevin cut his hair before the trip), many piercing stands along with lots of hookah sets for sale. It was a very ecclectic market, to say the least. Anna and I purchased some awesome salsas from a mole stand that we can’t wait to bring home. Mine is called salsa con 7 chiles and it has pepitas and almonds in it. I can’t wait to spread it on a baguette with some good cheese. Yum! We Ubered ourseleves back to the Red Tree House to drop off our purchases before walking across the street to enjoy our main meal of the day at the Casa de las Yeyas. 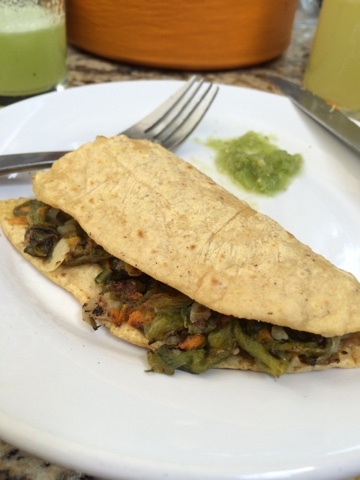 Our appetizer was a quesadilla (without cheese, but whatever) made from flor de calabaza (squash blossom). 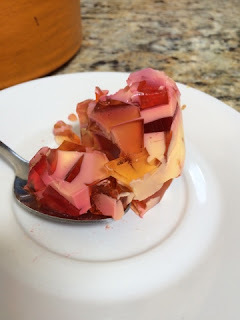 I made both kids try it and they loved it! 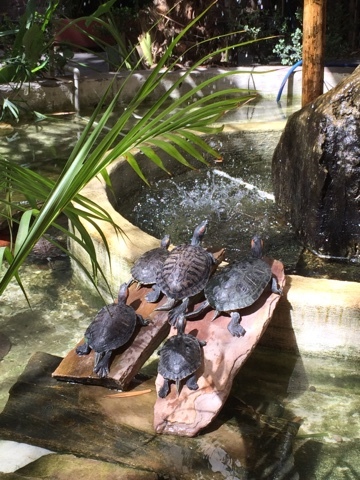 We sat outside by a quaint fountain that had several turtles climbing about while we chatted and ate our meal. We enjoyed three different agua frescas while waiting for our main meal. The one of the far left is lime with chia seeds. The middle one was my cucumber and lime. 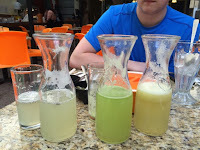 The one of the right is Anna’s pineapple agua. Aguas aren’t juice, but contain juice. They don’t have as much sugar as punch, but they are sweet. Oh, and did I mention they are really good? The spaghetti and spinach soup was our next course. 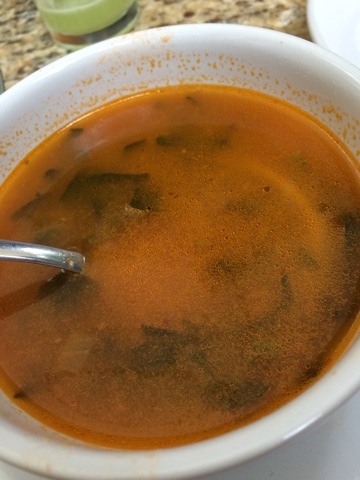 It was a bit on the spicy side, but we all enjoyed it! This was the main meal that Anna and I enjoyed. 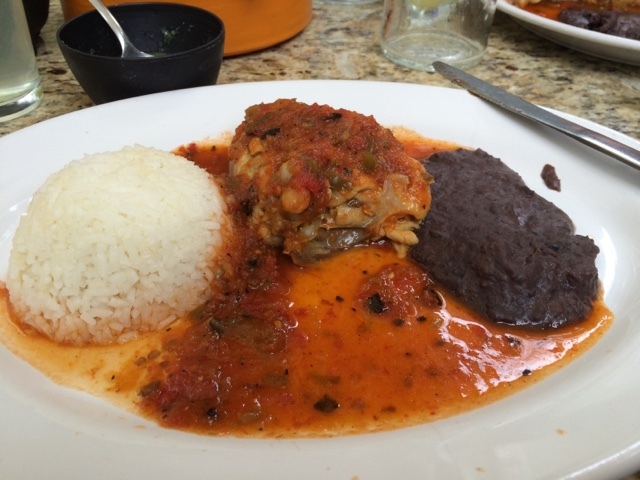 It was a chicken thigh (her piece was a leg) along with a spicy red sauce, rice and black beans. All food was served with freshly made corn tortillas and salsa verde. Dessert was included in our meal today. We were all excited (even though I have repeatedly said that Mexicans stink at dessert). Well, guess what? I was right again. This cubed gelatin thing was our dessert. Oh well, there’s always ice cream later. I’m on a quest to try avocado ice cream at a place called Tepoz Nieves. I WILL get there this week! These were the cute turtles that we watched during our meal today! They were all scrambling to find their place in the sun. Aren’t we all? One of the interesting things about this restaurant is that while they allow dogs, the dogs must be chained to the wall while patrons are eating. It was the cutest, yet saddest thing! It was like a doggy wall of shame. We rested in the hotel room for a bit after making a pit stop at the local 7-11 for some cold beverages. 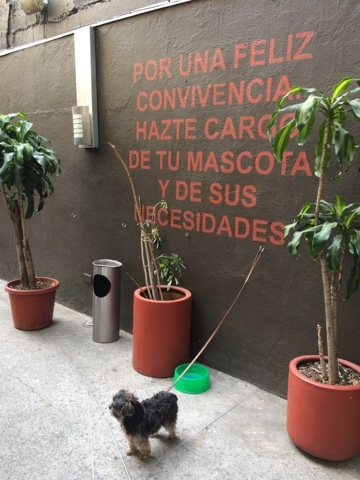 Our evening will consist of hanging out with the eclectic visitors here at the hotel followed by a stroll through the Parque Mexico on our quest for ice cream. Tomorrow is Easter! 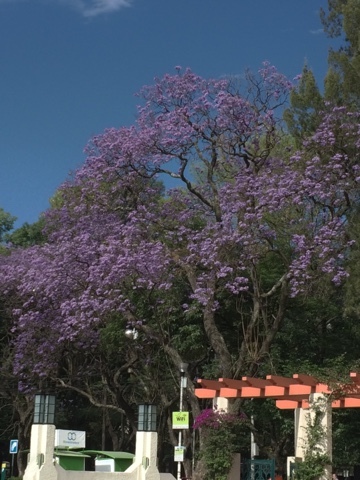 We plan to walk the entire length of the Paseo de la Reforma and then spend time in the Centro Historico. This will include mass at the Cathedral and hopefully a meal. They tell me everything will be closed, but somehow I doubt this. 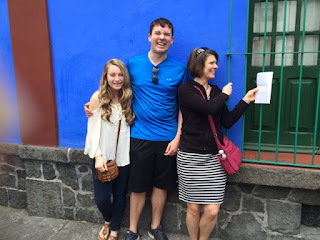 I can’t wait to show the kids all of the monuments along Reforma, the zocalo, the Cathedral, the National Palace, the Templo Mayor and so much more. It will be a big day for them! They are hanging in there like real travel pros! It’s amazing to see CDMX through the their eyes. They are like kids in a candy shop. Their eyes are wide open and their ears are overwhelmed by the complete immersion into a Spanish-speaking place. Oh and of course, the weather is perfect here.